Speed your way to campus coolness as Bic Writing Instruments bring you its exciting back-to-school reward. Let Bic Writing Instruments help you ace your exams, give color to your dreams, and pour your heart out in writing. Quality and value are guaranteed with Bic's tropically designed ink system that can adapt to your needs whenever, wherever. 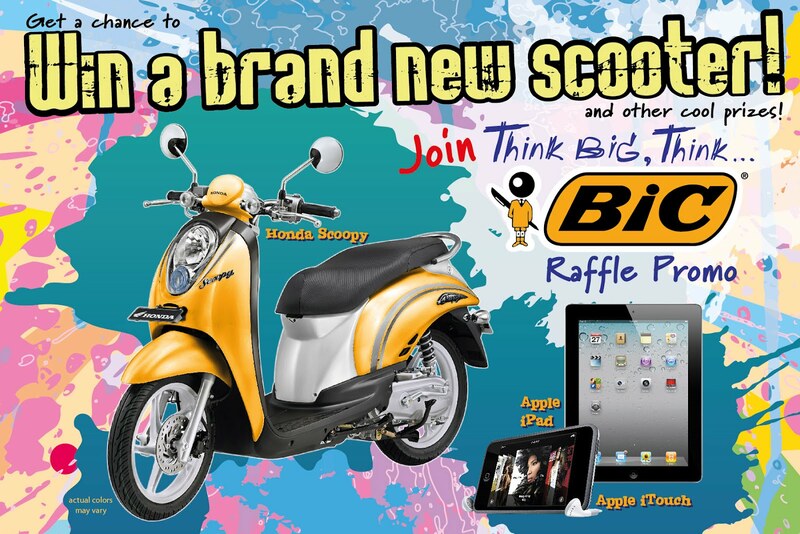 Plus, you get a chance to hop into your very own Honda Scoopy or take home a brand new Apple iPad or iTouch with the Think Big, Think BIC raffle promo. 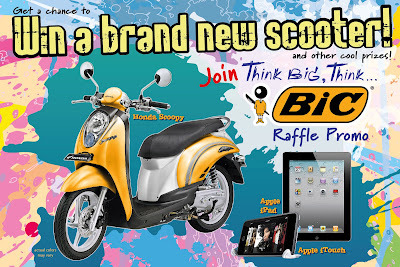 A single-receipt purchase of Bic products worth P50 at any participating store entitles you to one raffle coupon. Get five coupons when you buy P200 worth of Bic items (single-receipt purchase). The more you buy, the more chances of winning you'll have! Think big and think BIC! Promo runs from April 15 to July 15, 2012. See posters or log on to www.filstar.com.ph for more details. Per DTI-NCR Permit No. 1897 Series of 2012. Participating stores: National Book Store, Pandayan Book Shop, SM Supplies Station, Robinsons Department Store, Sta Lucia East Department Store, Landmark, Puregold, NBS Book Express, Uno Stores, CSI, LCC, Magic, Gaisano Grand and Gaisano Metro.